Intertek Plastics Technology Laboratories (Intertek PTL), the Leader in Plastics, Elastomers, Film and Composites Testing, provides a variety of testing and specimen preparation services to meet industry requirements. Intertek PTL provides fast, knowledgeable and cost-efficient testing services. Intertek PTL’s services include a variety of specimen preparation techniques for plastics, elastomers, composites and films. Machined Test Specimens: Services provided by Intertek PTL include a Machining Center with CNC machining, Bridgeport and Lathe capabilities. Intertek PTL provides machined specimens from virtually any type of plastic or composite parent form including sheet, rod, tube or profile fabrication. Special machining techniques utilized by PTL ensure low stress, smooth surfaces and uniform dimensions. PTL’s CNC machine accuracy of +/-0.0002 inches surpasses ASTM and ISO requirements and ensures accuracy and repeatability. 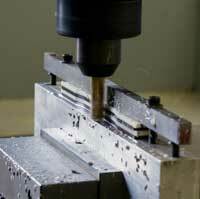 Machining capabilities include carbide and diamond tooling for plastics, epoxy and composites to name a few. Die-cut Test Specimens: Intertek PTL’s services include in-house Die-Cutting of films & elastomers to meet ASTM and ISO specifications. Die-Cutting services include use of Ontario Razor Dies for flawless, defect-free preparation of samples. In-house die-cutting of films and elastomers ensures optimal turnaround. Injection Molded Test Specimens: A variety of molds are offered including ISO and ASTM family molds and balanced molds per standards on mold design ISO 294 and ASTM D3641. Specimens are molded by a local approved injection molding supplier. PTL provides a limited range of compression molded specimens. Contact customer service for more information. Intertek PTL the Leader in Plastics, Elastomers, Composites and Film testing provides fast, knowledgeable service. To learn more about tests performed at Intertek PTL, visit the Testlopediatm section of our site, a free encyclopedia outlining nearly every test required by the plastics, elastomers, composites and film industry. Let Intertek PTL's knowledge of materials assist you in achieving your program goals. Contact Intertek PTL today to request a quote.